I remember having the music from the Good, Bad, and the Ugly on 8 track in my car. Tuco taught me a lot about religion in that movie. Tuco: You became a priest because you were too much of a coward to do what I do. Amazingly Marlboro was conceived and first marketed as a woman's cigarette. The brown filter hid lipstick. I never smoked, but in HS Marlboro had about a 95% market share among the yutes at my school, with a Winston holdout or two. You've come a long way, baby. Virginia Slims. great dependable rides, had a lot of fun with them. Do you remeber the 1970 (or 71?? I can't remember) Ford Super Cobra Jet Torino. Mine was Canary Yellow Black Hood with the Black Slats across the rear windows Ram Air 429 cu.in. Did the quarter mile 110mph. We had 2 street "strips" that were perfect for 1/4 mile dragging. The police were not that bad on us-- they would stop us from dragging but few arrests or chases. Only if we defied them after they came thru with lights on did they go after anyone. The "strips" had no side streets and lots of road to spare to slow down. Really was no threat to anyone BUT the 2 racing. Saturday Nights the crowds would form at the start line/light and enjoy the show! (There was a Bowling ally & Billiards just down from the start line) There were some really hot cars too. It seemed everyone owned one. You could smell the smoke of burning tires a mile away. It was good in those days ....This could never happen today. No way. We had 2 street "strips" that were perfect for 1/4 mile dragging. .
Nice Bike. 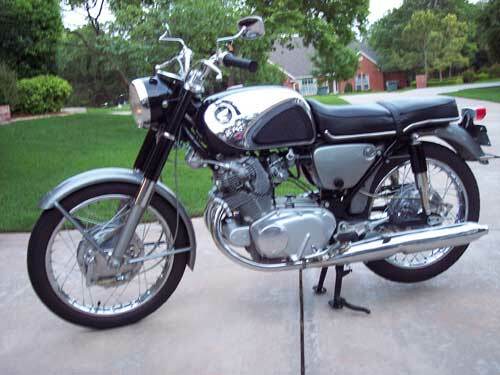 I had 750 honda and a Sportster (SIC) (or did i spell it right no matter)..back in the early 70's AMF was the maker...whoever they were!! Rode with a group for a while lots of good times--- had a couple of bad dumps too on the Sportster messing around. thanks for the reply...I sense I've lost a few "friends" around here. Remember the first time you did hallucinogenic drugs? I was 16, my family rented a house at the Jersey shore for a week; I'd found a party. Drinking wine, someone passed around some foil with strawberry powder on it; I was told to wet my finger and taste it. It tasted good, so I did it several more times: I had no idea what it was, other than tasty. Whoa ... a wild and wonderful night, all except rolling in about 3 AM, parents awake trying to talk to me, me in the throes of a monster mescaline trip. Just "Grass" as it was called back then...I skipped the meth and acid. All boozed up and smoke up and off to wild drunken happy hours. This place we went to was so crowded that we used to p**s at the bar on the wall/floor --gross-- I know but thats what you had to do. There was beer and booze on the floor anyway. Otherwise it was 15 minutes fighting the crowd while they were hootin and a howlin! They used to have great "sing along" entertainers and it was a total zoo. free shots of tequilla if you provided a real good howl or bird call!!! Those happy hours are what I missed the most. They are no longer allowed! A civilization..."Gone with the wind"
& then the party back at the cottage!!! I remember it well. In New England, soda was called tonic and still is by many.